U.S. President Donald Trump faced heavy criticism on Monday killing after dumping a whole box of food into a pond, which killed at least 14 carp. All major media outlets have covered the incident extensively with most reporting Trump was being too aggressive with fish in the region. 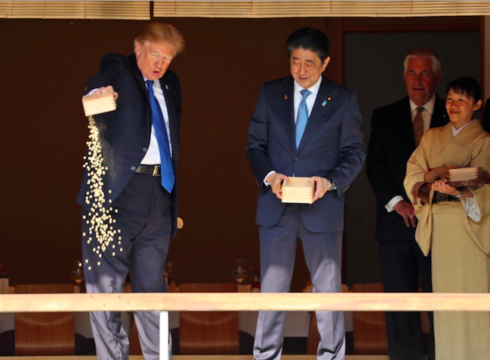 Conjecture surrounds exactly how many pellets Trump dumped into the pond, with some media outlets reporting there were only 50 pellets, while other media organizations, such as CNN, are reporting around 370 pellets were tossed into the water. “This guy is the worst fish feeder ever,” wrote AFP journalist Tim Watson. CNN is currently in the lead over their rivals with their carp story on Facebook attracting over 7,000 likes. The Clinton Foundation raised 63 million dollars to help out the overfed carp, but kept all but $2.50.